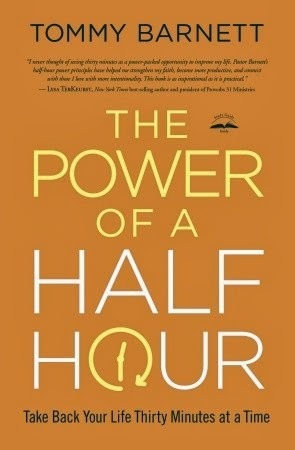 The Power of a Half Hour by Tommy Barnett was one I jumped at the chance to get and review. I'm ALL about learning more time management ideas to keep improving myself in this area, so I was excited to jump in. But unfortunately those never really came. It's a great idea, and a good book, but I came into it with the wrong mindset. I thought the book was a detailed plan kind of book on how to "Take Back Your Live Thirty Miniutes at a Time". But really, it was a collection of short stories and encouragement on how half hours could be used or wasted and the results of each. Once I realized that this book was more of stories than an actual plan, I was able to relax into it and enjoy it a bit more, but it still left me frustrated that it wasn't what it seemed to be from the description and cover. The stories are great. The ideas are great, but I think they've marketed the book all wrong, and because of that I was left wanting. These kind of reviews are so hard for me because I LOVE books, and I appreciate what the author of this book is trying to do, but I think the marketing is all wrong for it. Like I stated earlier, I was going into this thinking it would be a plan for accomplishing life changing half hours. The end does have a section of to do lists, but it almost seems an afterthought. Some sections pulled me in. Life stories from people the author/pastor knew are interesting, but again, it's more about stories and encouragement (which isn't a bad thing at all) and not so much about how to accomplish things (which is how it seemed to be marketed). The only real practical application part was at the very end, and some of it is really intense or somewhat confusing. (i.e. In a half hour, list names of any person you remember having wronged, but never asked forgiveness. OR, Ponder how much vision you think God has concerning your dreams.) What?? Nothing. I did write a few things down on a post it, but that is the extent of it. The suggested retail price is $22.99. If I had spent that much on it, I would be feeling sick to my stomach right now. I got this book for free to review, and I'm thankful for that. The book did have some great stories and some thought provoking ideas, but even getting it free, I seriously doubt I'll ever go back to it.